The measuring head is connected with the base unit by means of a coiled cable. This allows measurements to be performed on running machines. Three measuring ranges, 0–20, 0–200 and 0–2000 kV/m , can be selected using pushbuttons. At the same time, the charge sign is indicated. 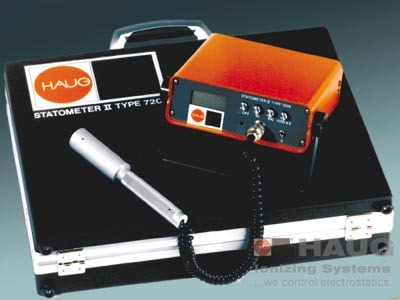 The unit is also equipped with a recorder ourput. The electricity supply to the unit can be either from NiCd batteries or from the mains. Standard accessories Measuring case incl. measuring cable, measuring head, magnetic holder, rechargeable batteries and mains cable.